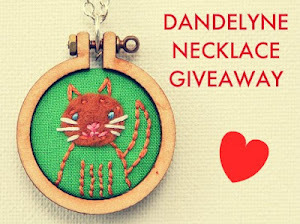 Thank you everybody, for entering the giveaway for a very special necklace from Dandelyne and spreading the word about Sonia's adorable needle art! There were 37 eligible comments and the trusty Random Number Generator has determined a winner! The orchestra is playing a jingle --- and the lucky contestant is --- Commenter No. 11! Congratulations, Amy! Sonia will contact you to talk about what you would like to choose! NO WAY! What nice news on this Monday morning :) Thank you, thank you, thank you! Congrat's Amy, it is very cute!